There are several paths one can follow to work with drupal and you don't have to be a rockstar drupal developer with 27 contrib module and 1000 core patches under his belt to be a valuable drupal resource. First you need to discover what interests you the most and at what level you think you can be valuable. You need to know what your skills are. Ask yourself these questions? Can I program in php or can I program in an other language than php? When going for a drupal job it helps when you are experienced in php and/or webdevelopment in general. But if you are not and you know how to program in other languages or you have experience creating html css sites you can be valuable. People with strong technical and infrastructural background can learn drupal. Do I have front end skills? Drupal jobs that require front end skills are in high demand since the rise of the mobile revolution. Lots of companies want a responsive website since this is easiest way to be present on mobile platforms. Most content oriented businesses tend to choose for a responsive website that adapts to any screen than to build an application for every platform. It is a lot more cost effective to have a content management system like drupal capable of serving responsive output than to build and maintain an app on every platform. Typically these front end developers are people with professional skills in design, html, css and a scripting language. With those tools they are capable of designing and implementing drupal themes that are responsive. A drupal front end job is all about designing great user experiences. Do I have site building skills? Drupal is evolving greatly as a site building tool. The tools drupal offer are amazing. Just by using the browser you can build an entire website. Of course learning how to use these tools is comparable with learning how to use photoshop which has millions of possibilities and require smart people being able to combine these options into maintainable applications. Drupal can build data types and define their data fields in the interface. Drupal has page builders that can build complex, context driven and responsive pages. Drupal has query builders that can pull any content in your database into themed lists. Drupal has export systems that allow drupal to stage content and configuration from one environment to another. Drupal jobs requiring site building are on the rise. We need people that can mash up these complex interfaces. It is not just clicking. A drupal sitebuilding job is all about building access points to content in the form of great useable and accessible user experiences. Do I have coding skills? Drupal developer jobs are in very high demand go down a bit and you will know what I'm talking about. A drupal developer has to have a wide range of skills. He has to know how to program in php, he has to know the drupal api which is extensive. He does not only have to know the core apis but also the contributed apis. He has to know how php works. He must use the right tools to be productive. He works a lot on integrations so he will have to know webservices and other standards like xml. If he has notion of other technologies that is usually a win. Today professional drupal development is a lot about integratin drupal in the companies IT infrastructure. A drupal developer job is all about tying up loose ends and building cool custom functionality all while contributing to open source. Do I have experience with other content management systems? Experience with a content management system is a bonus. Knowing what a cms is all about helps you think in the right direction. If you don't really know what a cms is check this. We believe drupal is the best content management framework and system out there. Content management systems are used more and more as a marketing tool to get the companies content out there. If you are willing to start your drupal job don't hesitate. Do I have experience with infrastructure management? To develop drupal in a professional way you need version control, continuous integration tools (jenkins), deployment scripts, staging environments, ... All these things need to be setup and maintained. It does not stop there most professional drupal hosting offers monitoring, maintenance and continuous improvement contracts. This require professional tools and they need to be setup, maintained and used. Drupal is being deployed in the cloud. Numbers grow quickly as drupal instances are deployed into the cloud. All these servers need to be managed. Using the right tools like puppet or chef these cloud servers and their stacks can be managed like any other server. Infrastructure drupal jobs are highly wanted and require a special breed of people because they also need to know how drupal works in order to consult developers on improving performance and security. The focus of infrastructure jobs has shifted away from the physical machines because they can be obtained and maintained a such cheap price that it requires special economical conditions to make it worth to own your own servers/datacenters. Therefore most of the drupal system administrator jobs focus tends to shift towards the application. Drupal is a great opportunity for infrastructure people to come closer to the application. Manage and monitor large cloud and/or hosted servers in function of drupal is a very cool drupal job. A drupal infrastructure job is all about making those drupal sites run. Do I have communication skills? Communication skills are always needed. But some drupal jobs require more of them. A drupal developer job requires communication so you can communicate with the client, team lead or project manager.But a drupal project manager requires even more communication skills because typically he needs to communicate with stakeholders, developers, clients, managers. He must be able to keep an eye on scope, deadlines and resources. Then you might wonder if you have the skills to manage a drupal project. When managing a drupal project it helps a lot if the project manager knows drupal. He has to know what it does and what it is capable of. It helps a lot if he knows what needs to be custom and what you get out of the box. 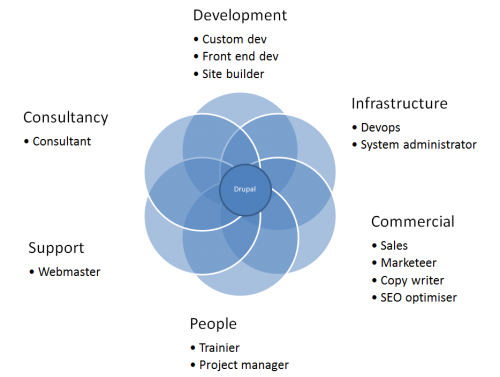 A drupal project manager job is all about combining drupal with people. Do I have excellent people skills? Do you have technical skills, people skills and communication skills? Then you might considering becoming a drupal trainer. A drupal trainer is a rare type of profile specialized companies are looking. These people know to transfer knowledge to other people and learn them how to thrive in professional environments. These people need to be very skilled in communication, have an ability to get the best out of people and require technical understanding of drupal. We train drupal trainers because we are drupal trainers. If you are a teacher in an other domain and have a technical background you might consider becoming a drupal trainer. A drupal training job is all about getting people passionate about learning drupal. Do I have work experience in other domains? We love to work and learn from professionals from other domains. If you are stuck in your current carreer and you want to change then the wide variety in drupal jobs might interest you. We know changing carreers is stepping out of your comfort zone big time and we have deep respect for people who are willing to this. We will support you and we know that you will not be able to know it all from day one but we are willingly to give skilled people the chance to work with drupal. We know that people who are good at one thing given the right support can become great a another thing. Do I have writing skills? Since drupal is a content management system often companies offering drupal services need copy writers. Copy writers should have a good notion of SEO so their text reflect the best possible optimization. Do I have marketing or sales skills? Drupal means business these days. With drupal breaking through in the enterprise there is a lot of demand for people with commercial talent to help push drupal further into the enterprise. This means big companies are starting to use drupal. They are building platforms with it and integrating drupal deeply into their IT infrastructure. They are building business around drupal, generating revenue, reducing costs, increasing interaction all with drupal. This is because everybody start to see the value of drupal, because drupal is combining social, content management and framework. Contracts being sold in the drupal industry are getting bigger and bigger. This means great challenges for commercial people. If your are a talented sales person or talented marketeer you can benefit greatly from the rise of drupal in the enterprise. Big contract mean big commissions. You don't sell alone. You should have support from drupal consultants who support you technically. Although it really helps having a technical background selling drupal solutions, it is clear that you can't know every technical detail. Being a in drupal sales job is al about showing the benefits of drupal to the client. Do I have a passion for supporting people and applications? Supporting people using drupal applications gets more and more in demand. As a drupal webmaster you bridge the gap between the user and drupal. You support users in using drupal. You need excellent communication skills. Optionally when you can combine this with seo and copy writing with webmastering you can be a very valuable resource. Doing one of these jobs can get you in a position to call yourself a drupal consultant. In fact a drupal consultant will have most of the time have one or two focus skills but should be aware of the other skills and their value. Drupal consultants are typically put at the disposal of the client they work for. A drupal consultant should consult a client on how to use drupal. He should have excellent drupal skills and communication skills. He should try and think how he could make the client money by proposing solutions, try to figure out what could reduce costs, what could increase value. Examples of drupal consultants proposing solution could be to install social features and gamification on their intranet to increase collaboration from their workers. Make their workers show who is sharing knowledge. Get the knowledge in your organisation out there. This increases value for companies because now they are less dependent on people falling sick or leaving. The knowledge stays in the organisation. Another example could be to propose a drupal marketing framework. This way the client can post all his content his has stored in their organisation online and attract customer with it. A drupal consultant should look for value that is why the client is hiring them. Drupal is full of opportunities for companies with content. What Does A Drupal Developer Earn? This topic might be a taboo in the drupal universe but we believe we can talk openly about it. On the junior levels it is not so much about getting out as much money as possible but it is about getting as much experience as possible. Get a chance to prove yourself. Once you arrive at the more senior levels and you have worked hard to become a drupal specialist you should be able to get paid very well. People who work hard and work smart, meaning if you keep learning and you keep expanding your knowledge, you keep push your comfort zone, you keep interested in other things, you will be rewarded greatly. A freelance senior drupal developer having 5 years of experience can charge up to 500€/day and more. On a contract base a senior drupal developer could earn a salary package as much as 60000€ annualy. It does not stop there high profile drupal consultants can earn even more if they can prove to the client that they have skills and knowledge than can transform their clients organisation by producing value and reducing costs. It should be clear that the drupal market is hiring and that drupal is here to stick around. Right now is a great time to start as a drupal developer. you'll get great chances. Betting your career on drupal is smart if you are passionate about web development. With drupal all levels of skill and interests are welcome. Junior drupal developers get the chance to get training and become experienced drupal developers. A Drupal development jobs are in high demand. Becoming a drupal consultants means variety of work and great pay. Drupal means not only paying bills but also evolve all the time and having some fun too. Choose a drupal carreer, you won't regret it.